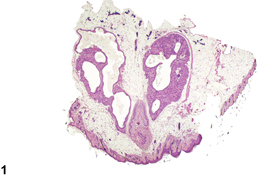 Clitoral gland - Atrophy, Unilateral in a female B6C3F1/N mouse from a chronic study. The gland on the left is atrophied, while the gland on the right is within normal limits. 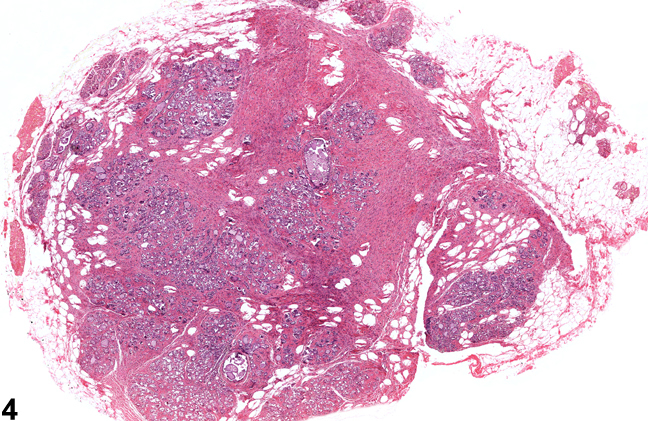 Clitoral gland - Atrophy in a female F344/N rat from a chronic study. There is a reduced amount of glandular tissue and more numerous ducts. 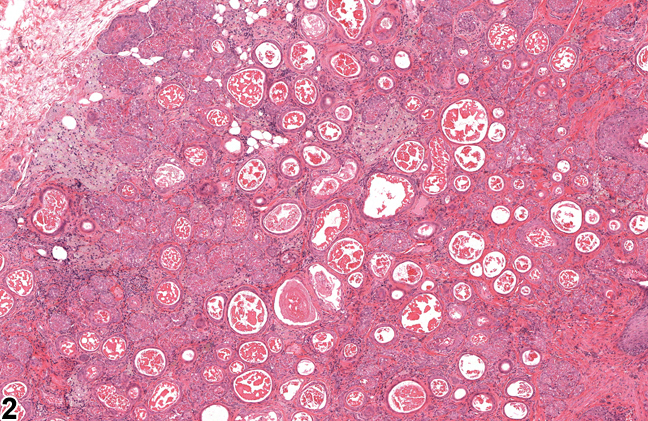 Clitoral gland - Atrophy in a female F344/N rat from a chronic study (higher magnification of Figure 2). 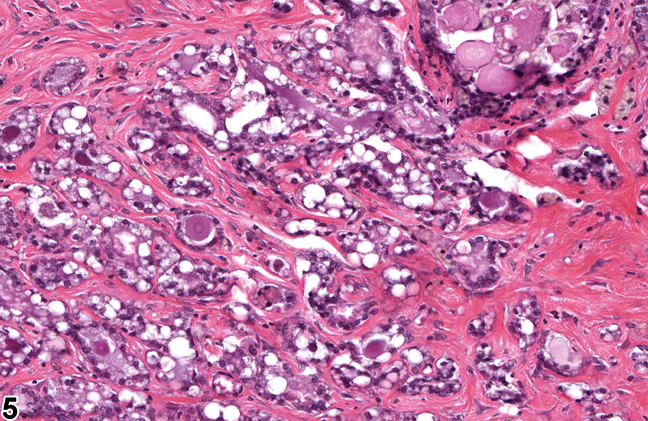 The amount of glandular tissue is decreased, and the ducts are prominent. 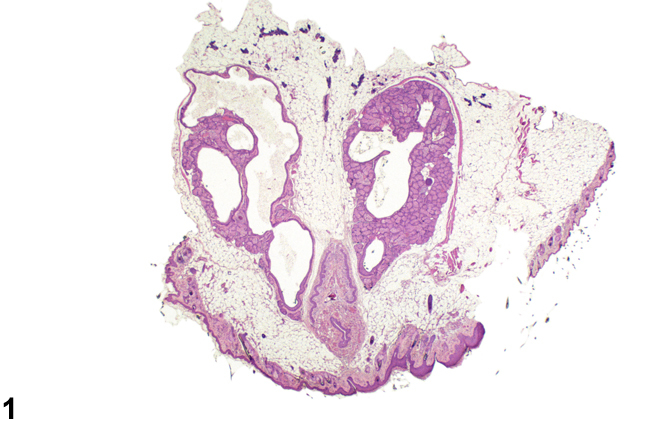 Clitoral gland - Atrophy in a female F344/N rat from a chronic study. 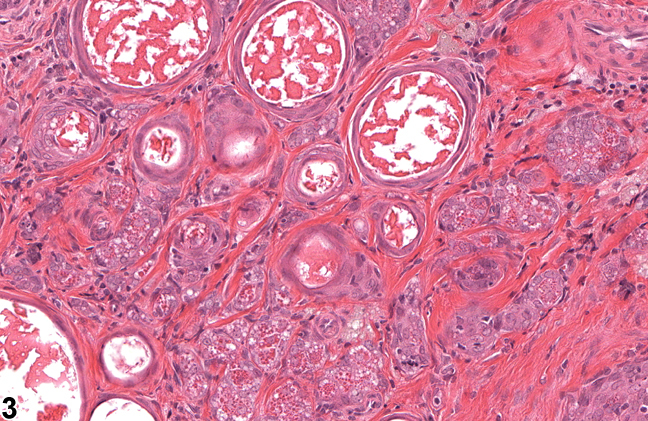 Some of the glandular tissue has been replaced by fibrous connective tissue. 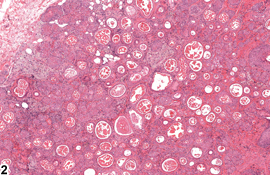 Clitoral gland - Atrophy in a female F344/N rat from a chronic study (higher magnification of Figure 4). There is an increase in intervening fibrous connective tissue with a reduction in glandular tissue. Atrophy of clitoral gland parenchyma is a spontaneous aging change in mice and rats. 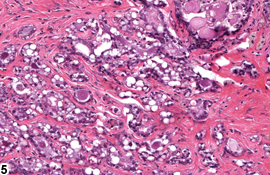 Atrophy also accompanies duct dilatation ( Figure 1 ). Mild inflammatory cell infiltrate may also be associated with the reduction in glandular tissue. 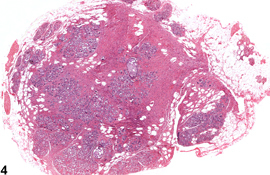 The hallmark of atrophy is a reduction in the amount of acinar tissue of the clitoral gland; individual acini are composed of small numbers of sebaceous cells containing variable amounts of dark eosinophilic secretory granules. Frequently the lateral ducts, distended by accumulated secretion, are prominent ( Figure 2 and Figure 3 ). 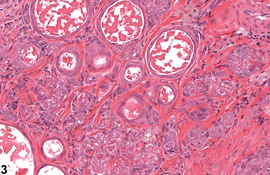 There is often an increase in the interstitial fibrous tissue ( Figure 2 , Figure 3 , Figure 4 , and Figure 5 ). Clitoral gland atrophy should be diagnosed and given a severity grade whenever it is present. Inflammation accompanying clitoral gland atrophy should not be diagnosed separately unless warranted by severity. If atrophy is secondary to duct dilation, then atrophy does not need to be diagnosed separately but should be described in the narrative if treatment related. National Toxicology Program. 1995. NTP TR-439. Toxicology and Carcinogenesis Studies of Methylphenidate Hydrochloride (CAS No. 298-59-9) in F344/N Rats and B6C3F1 Mice (Feed Studies). NTP, Research Triangle Park, NC. Seely JC, Boorman GA. 1991. Mammary gland and specialized sebaceous glands. In: Pathology of the Mouse: Reference and Atlas (Maronpot RR, Boorman GA, Gaul BW, eds). Cache River Press, Vienna, IL, 613-635.